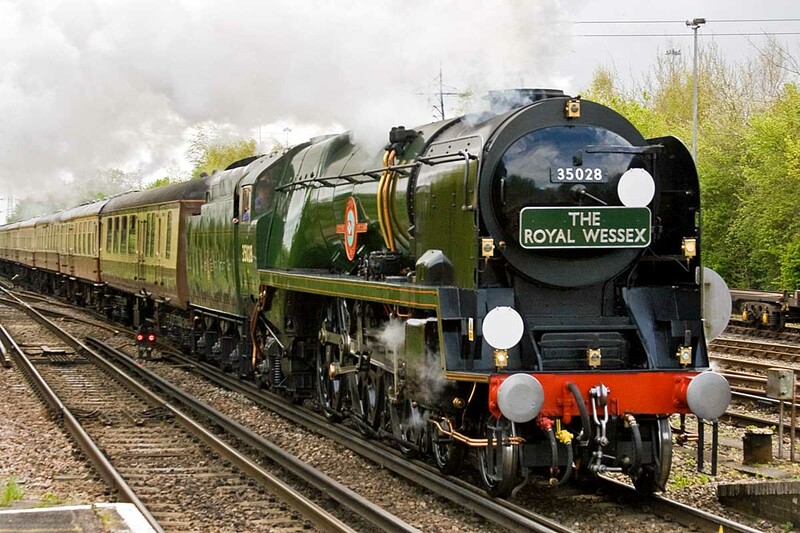 1Z97 08:45 Victoria - Swanage, 1Z98 17:15 Swanage - Southampton UGL - Redbridge - Laverstock - Waterloo. 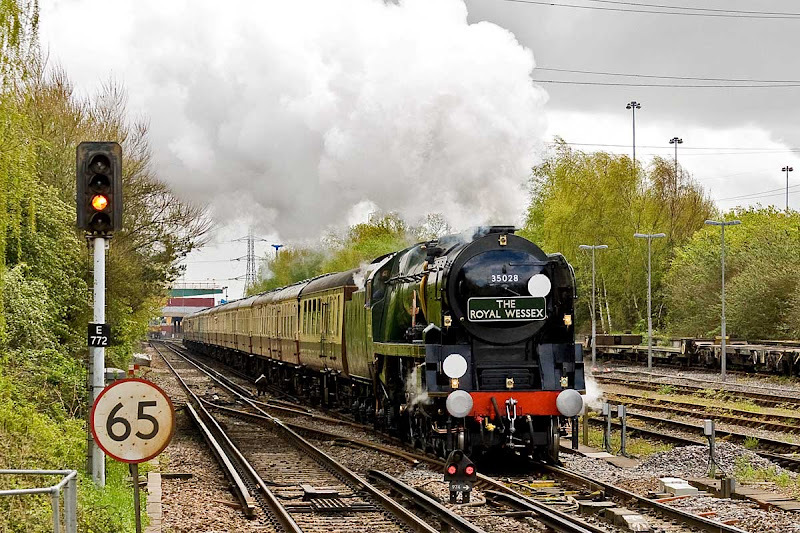 35028 approaching Redbridge just before noon. Redbridge. The locomotive was built at Eastleigh in 1948, and was the last of class to be rebuilt, in 1959. 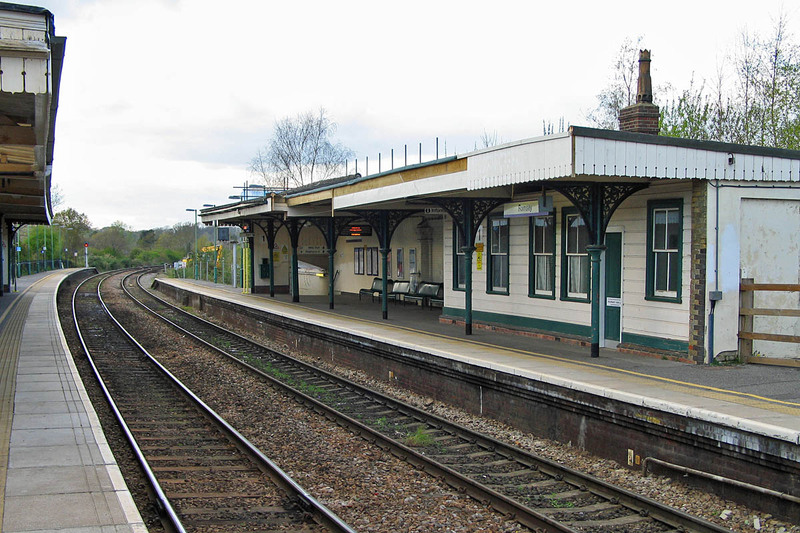 In the evening on the return journey, again at Redbridge. Image by Ian Knight. 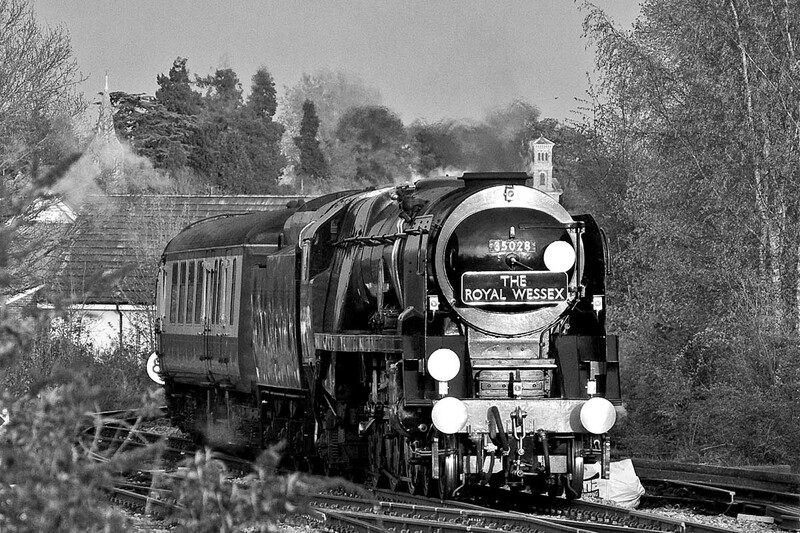 Approaching Romsey a few minutes later. The two chapels in the graveyard are in the background, that on the right is listed. Romsey. The first BFK is support coach 17096 Mercator built in Derby in 1968. Detail of the locomotive at Romsey. 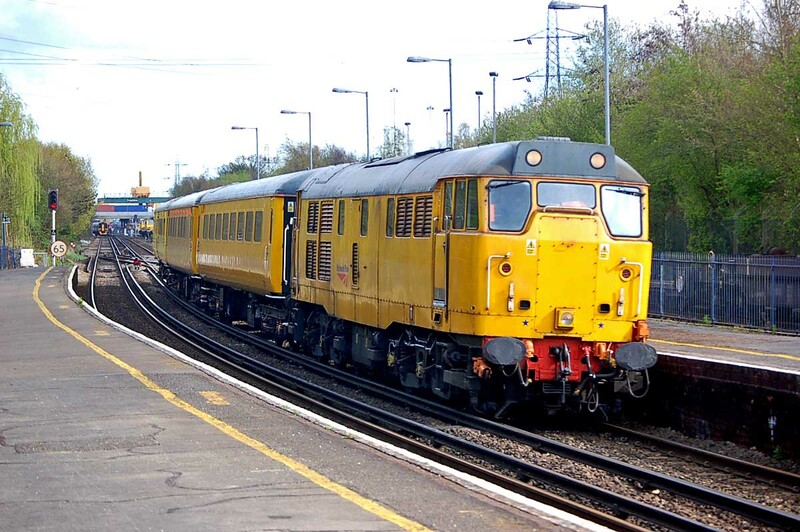 The disc code is for "Waterloo or Nine Elms and Brockenhurst and Bournemouth West, via Sway"
97301 at Eastleigh, 27th April. Image by Ian Knight. 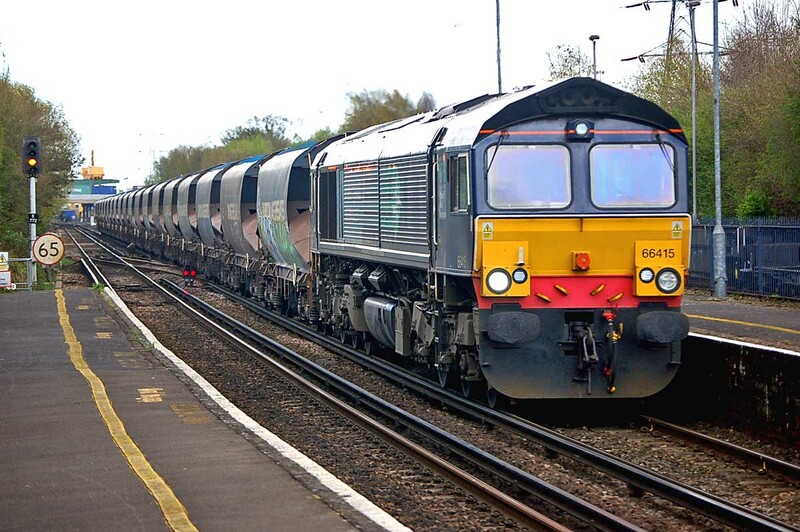 67028 with 1Z98 at Redbridge, 27th April. Image by Ian Knight. 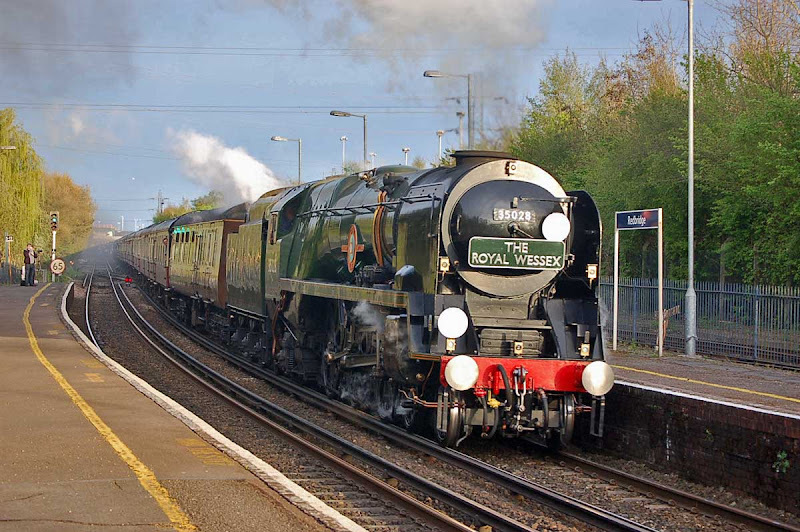 Thursday's 'Cruise Saver' started from Edinburgh with 47841 + 47818 in T+T. However it ran into trouble only a few miles into its journey at Monktonhall where 47818 shunted 47841 to the rear and then continued, but to expire with low oil at Aldwarke Jct. (Rotherham). 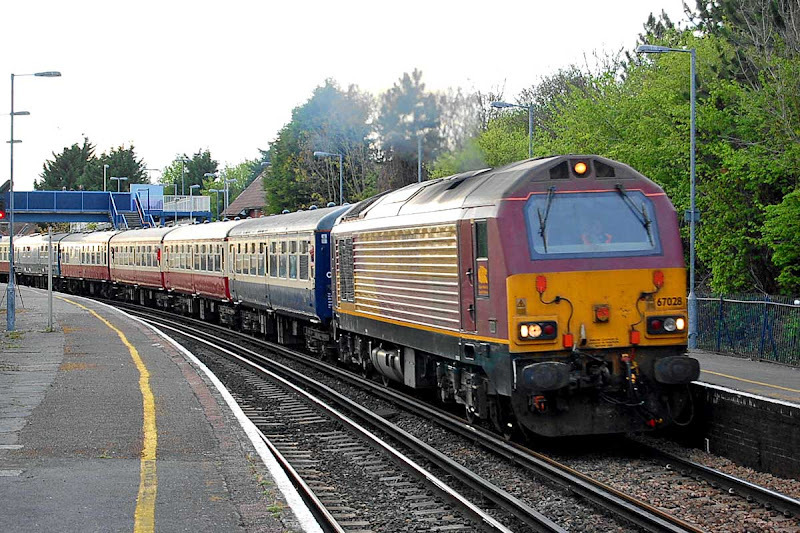 After an initial rescue by Freightliner 66520 to Barrow Hill, the train was taken to Southampton by adding 37601 + 37409, arriving about 2½ hours late at 18:42, after the departure of 'Oriana' reportedly leaving 65 passengers behind. See cruise discussions at pocruises & cruiseforums. Passengers given options including flying to join the cruise on Sunday. "There are no restrictions on baggage, and with almost 250 fellow guests on board no risk that the ship will leave without you"
Other passengers were fortunate to catch the 'Ventura' which was delayed for some repairs, not to await the Cruise Saver. The ECS was only worked as far as the car loading terminal adjacent to Millbrook one two three. On Friday the ECS was worked by 37401 + 37601 + 47841 (DIT) & 47818 (idling) on rear. 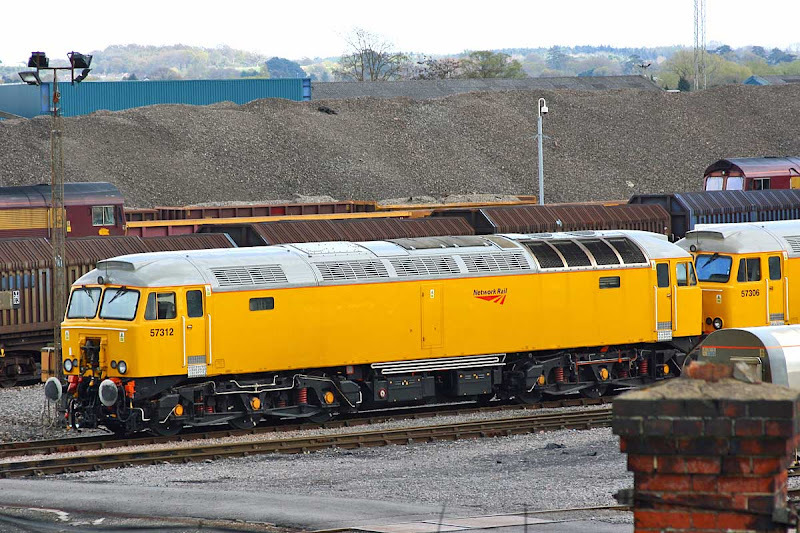 47501 has been stored into pool XHHP, the DRS holding pool, and is believed to have a main generator failure. 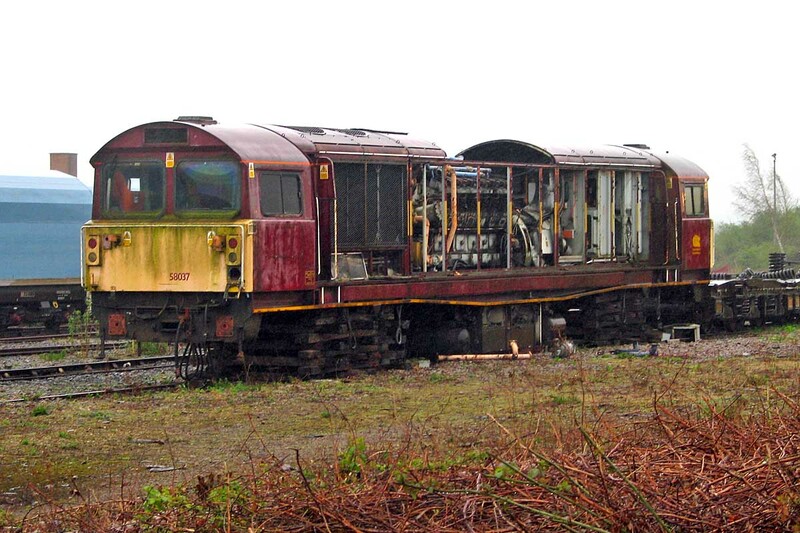 There is a report that it may be coming to Eastleigh for stripping, to support overhaul of 47839. New as D1944 from Brush, Loughborough in June 1966. 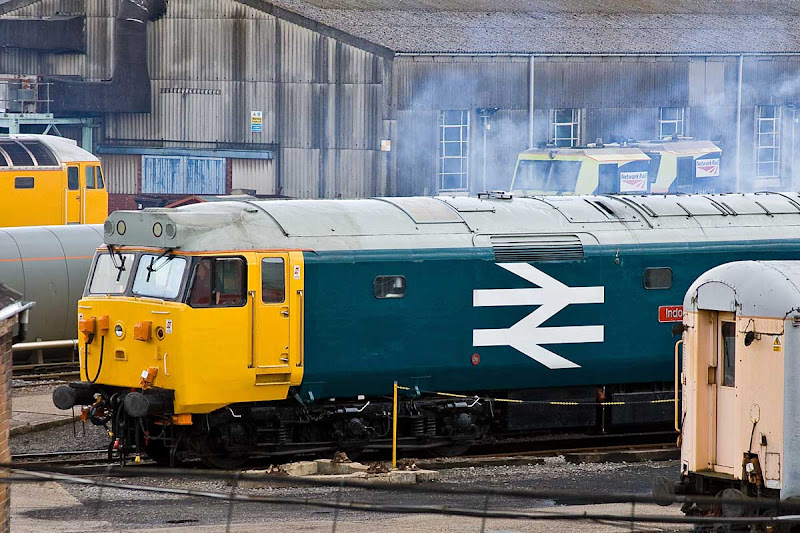 Renumbered to 47501 from February 1974. Stored by EWS in April 1999, withdrawn in April 2001. In October 2002 acquired by DRS and passed through Glasgow Works returning to traffic in September 2003 after overhaul and twin-tank modification. 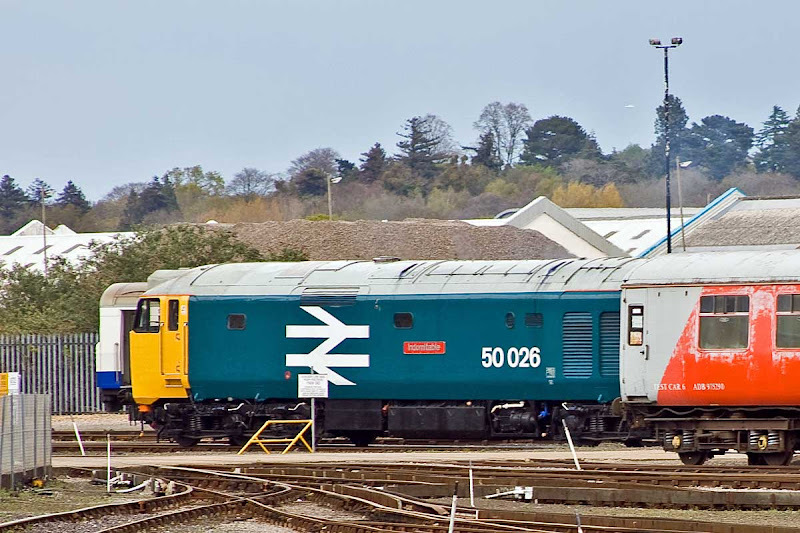 It is said that 47802 may now be on hit-list at DRS as it is at same design level as 47501. 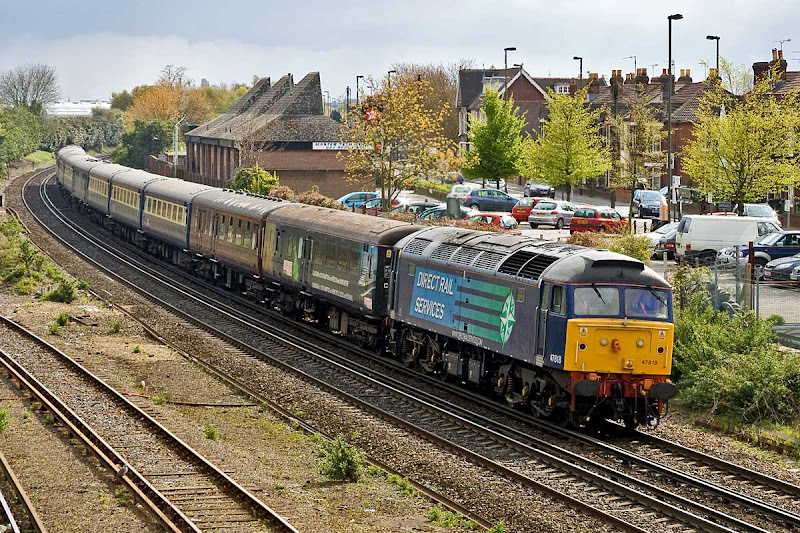 UPDATE: David Mant sent me this picture of 47501 at Salisbury on what appears to be a West of England service in 1988. My notes show that the locomotive had an overhaul at Crewe completed in June 1986. 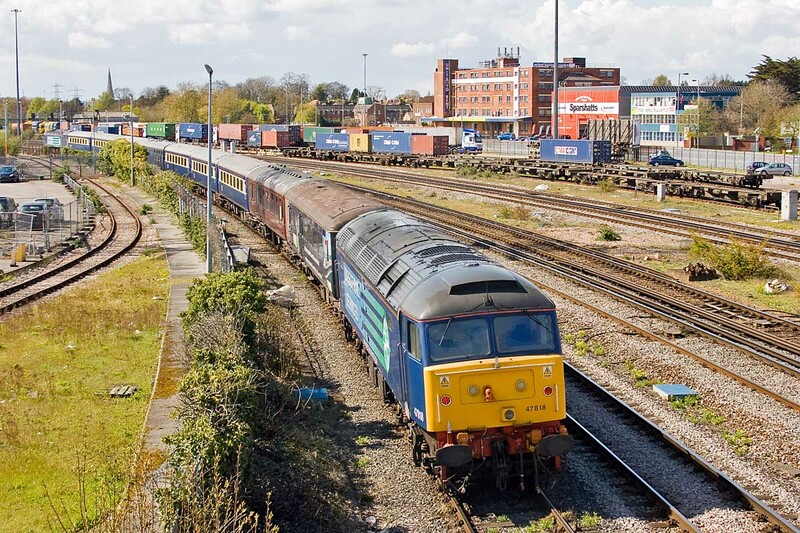 47818 approaches Eastleigh with 5Z73 ECS from Western Docks, running much earlier than scheduled. 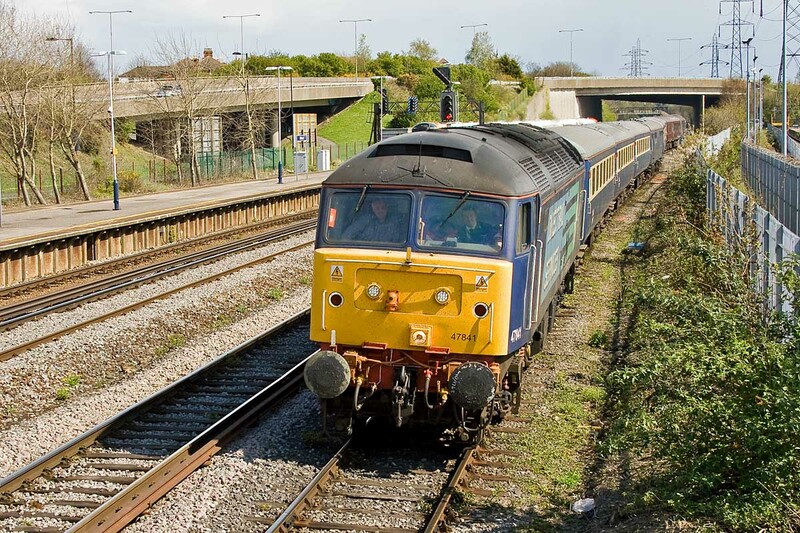 47818 clags as the signal clears. New as D1917 in December 1965 from Brush, later 47240 and 47663. 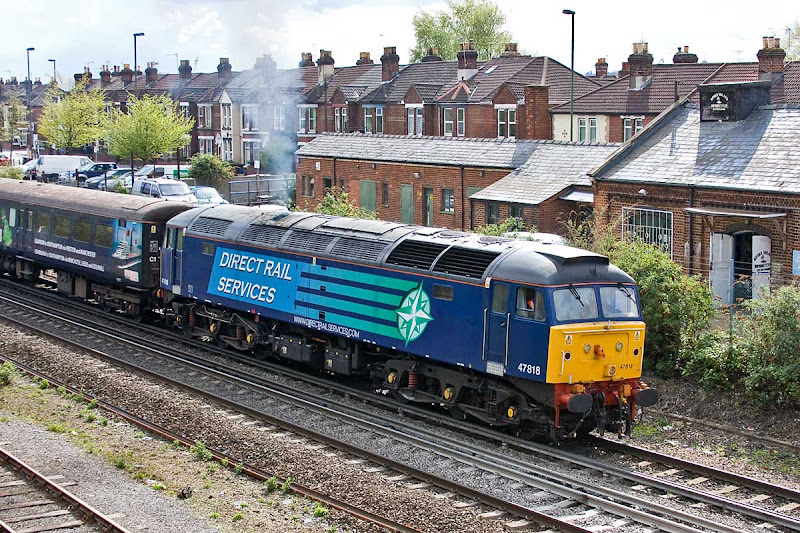 47841 works the ECS into the carriage sidings, via the depot loop. 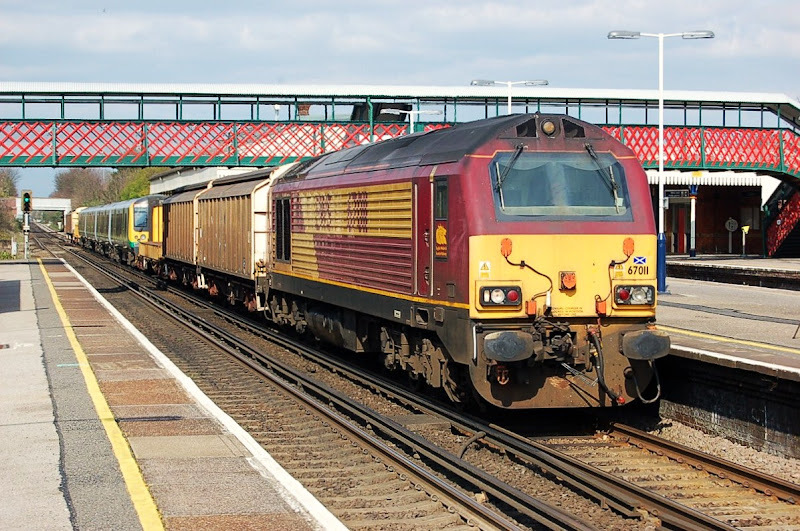 There should be a northbound ECS shortly as the next working is a repeat itinerary on Thursday 26th, and baggage car will be at the rear of the southbound train if the ECS goes by the West Coast. 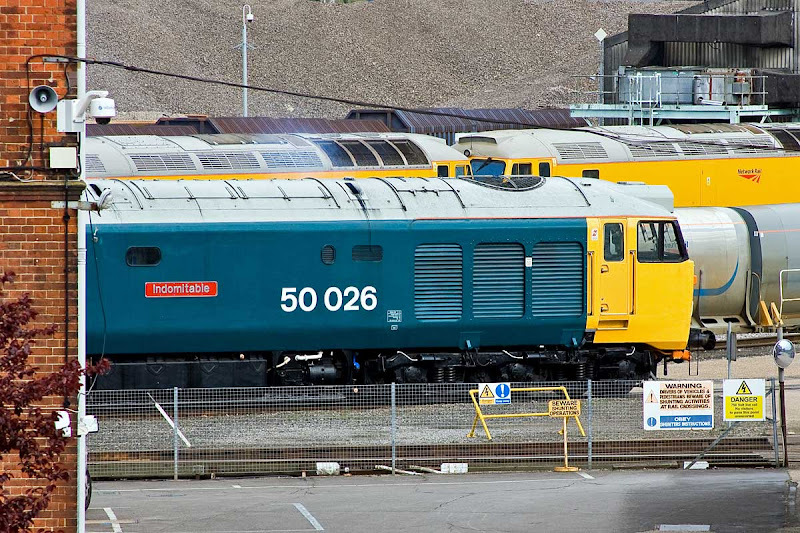 50026 Indomitable seen moving under test at Eastleigh Works. 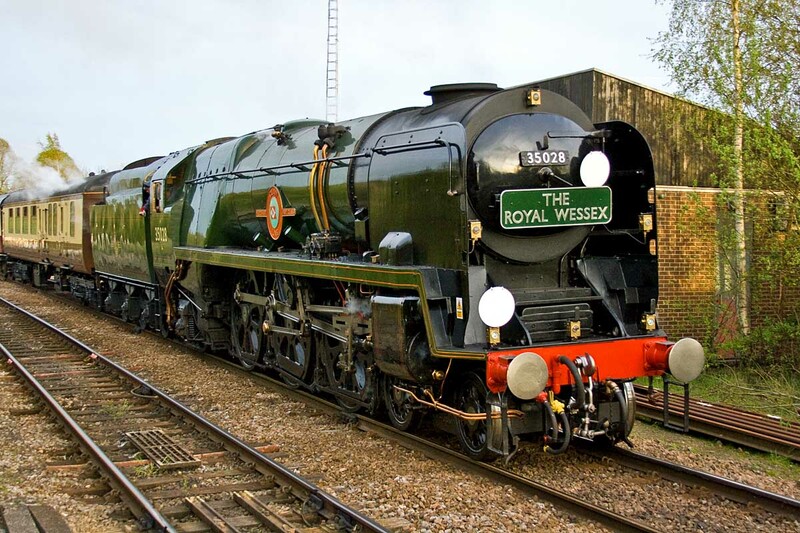 The loco is scheduled to appear at the Swanage Railway Diesel Gala in three weeks. The locomotive was left running here for some time. 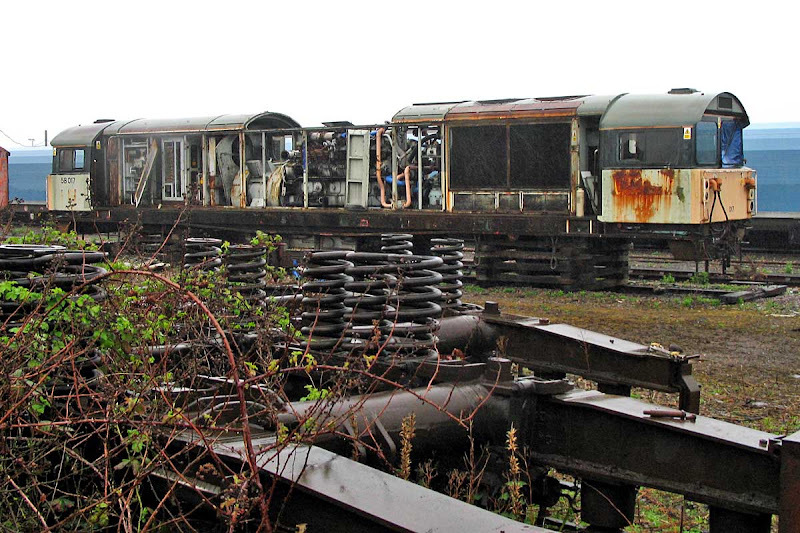 New as D426 in June 1968 from EE Vulcan Foundry and withdrawn in December 1990. 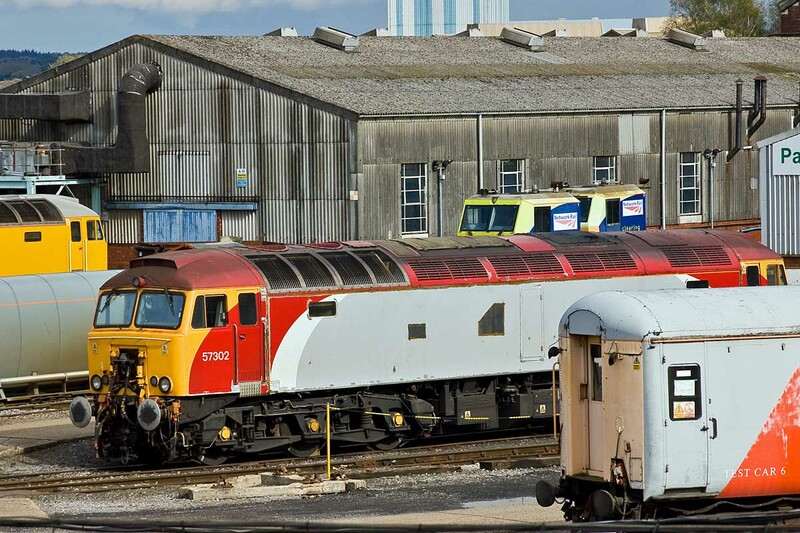 57302 formerly Virgil Tracy awaits transformation into a DRS loco. 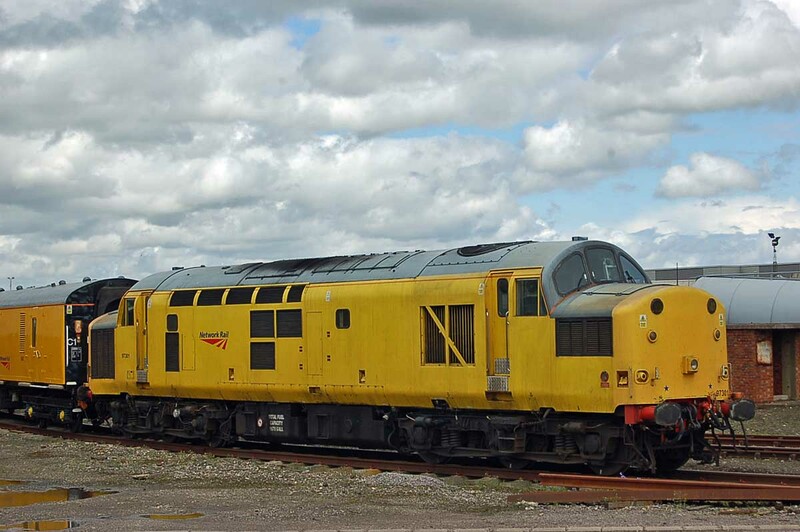 Originally D1928 completed by Brush in January 1966 then 47251, 47589 and 47827. 47841 passes Millbrook for entry to Western Docks to terminate 1Z73 05:40 from Edinburgh. 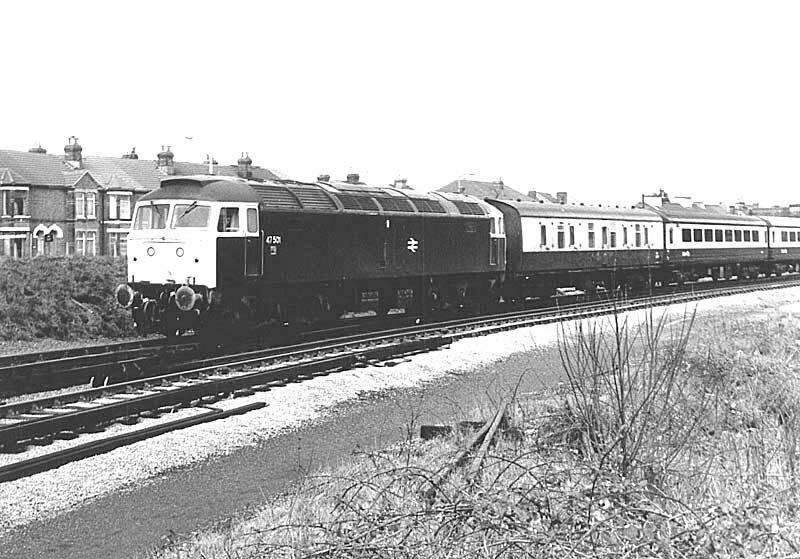 47841 was new as D1726 from Brush in March 1964, and later was 47134 and 47622. With its oval buffers, 47818 was on the rear. 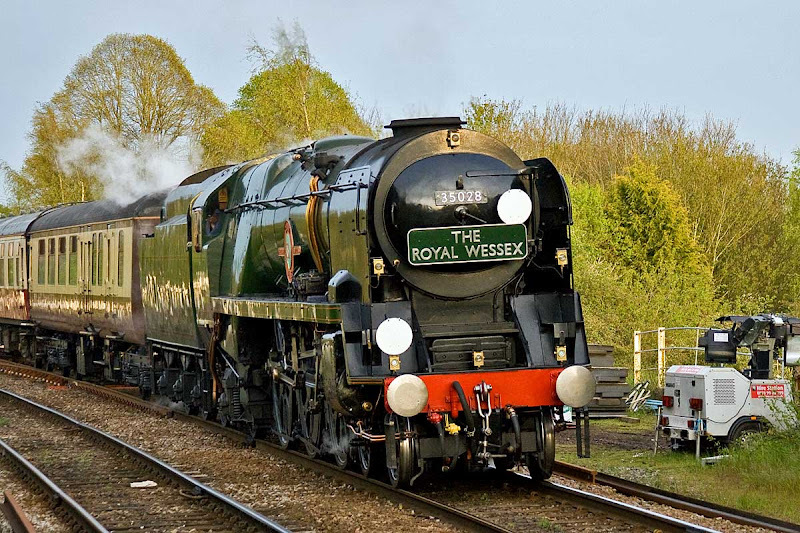 4464 Bittern passing Redbridge with 1Z37 Swanage - Banbury, 19th April. 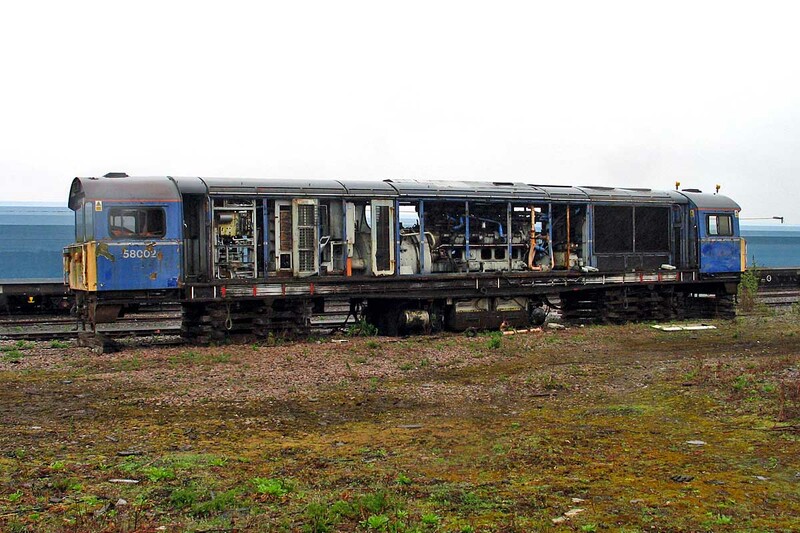 The coaches were a mixture of SRPS and Jeremy Hosking owned vehicles. 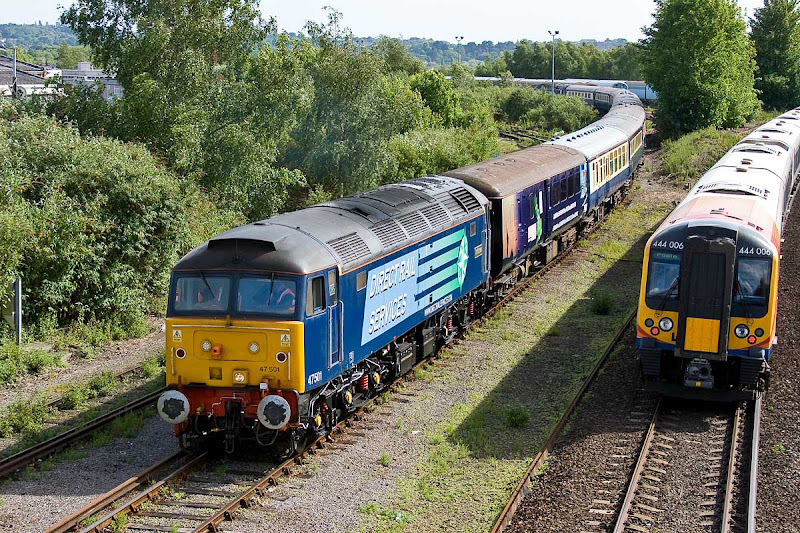 Stock for 1Z36/37 was 35185 (SRPS) 3150 (SRPS) 3148 (J Hosking) 1730 (SRPS) 3115 (SRPS) 3096 (SRPS) 3125 (J Hosking) 13227 (J Hosking) 1859 (SRPS) 4856 (SRPS) 4831 (SRPS) 4832 (SRPS) 17013 (J Hosking - Bittern support coach). 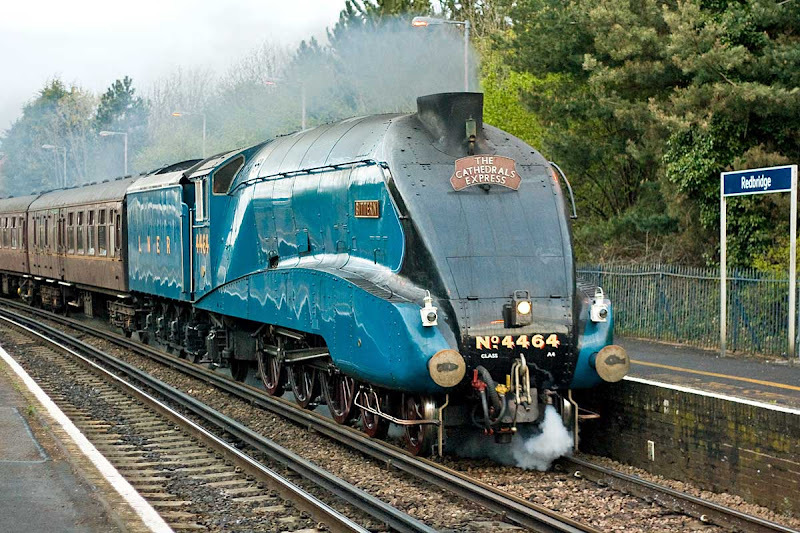 All of J Hosking's registered main line coaches were in the consist. 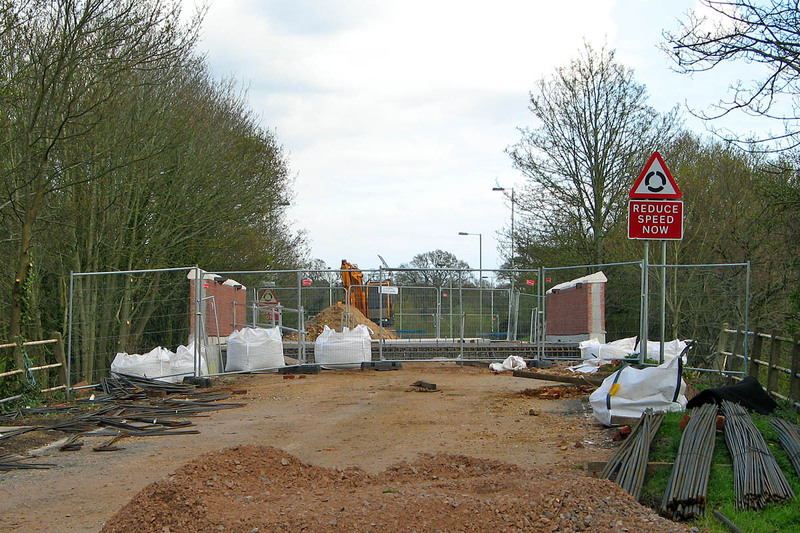 The new A27 Ashfield bridge, erected at Easter 2012. 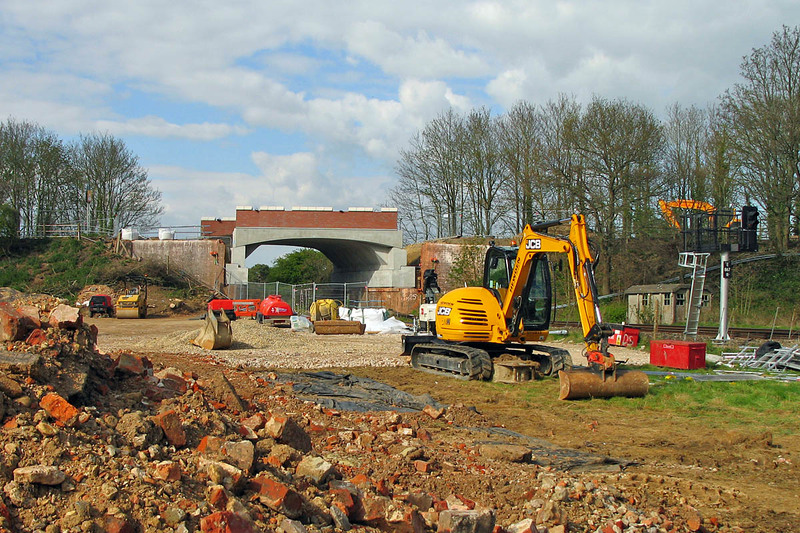 The rubble in the foreground is material from the old bridge. 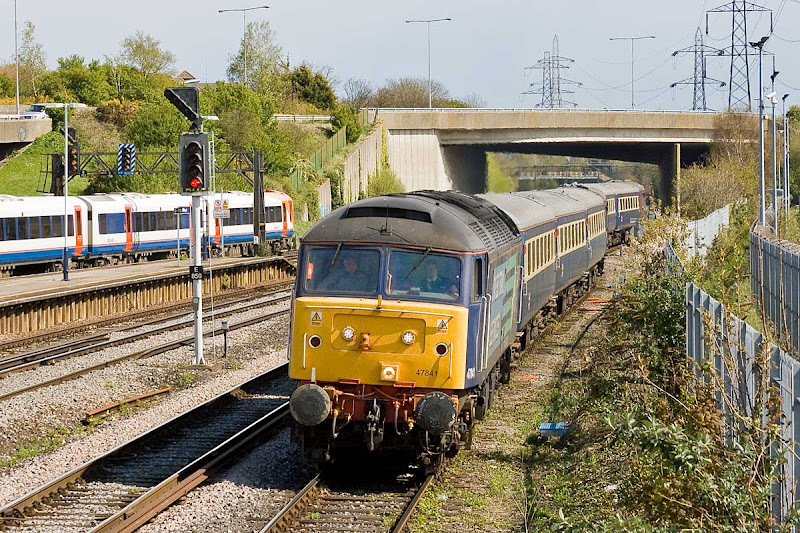 There is also a new E867R signal replacing one of ML Engineering pattern, which would have been erected at the resignalling 30 years ago, as illustrated below for 31st March update. 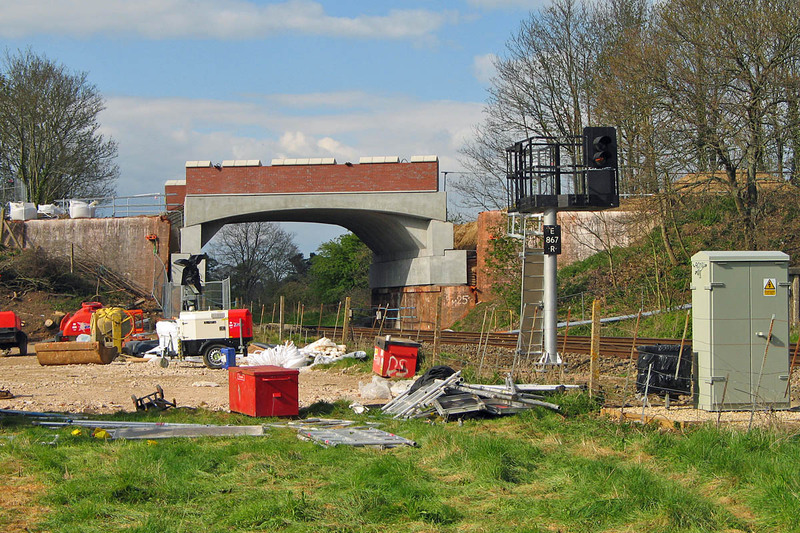 Similar pattern signal E861 (down from Eastleigh in the Tadburn Meadows area) is also being replaced - still in use today, with its replacement in position. At deck level (taken from a fence), it can be seen that the steel ties have been positioned ahead of concrete pouring. 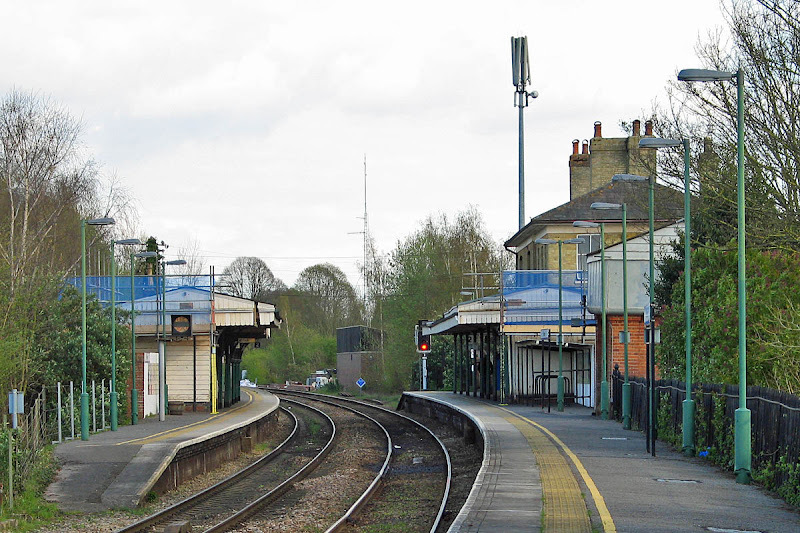 Clearance works are under way on the canopies at Romsey station. The down platform (left) has been completed, and work is under way on the up platform. A view of the complete down canopy (right) and partially completed up (left). 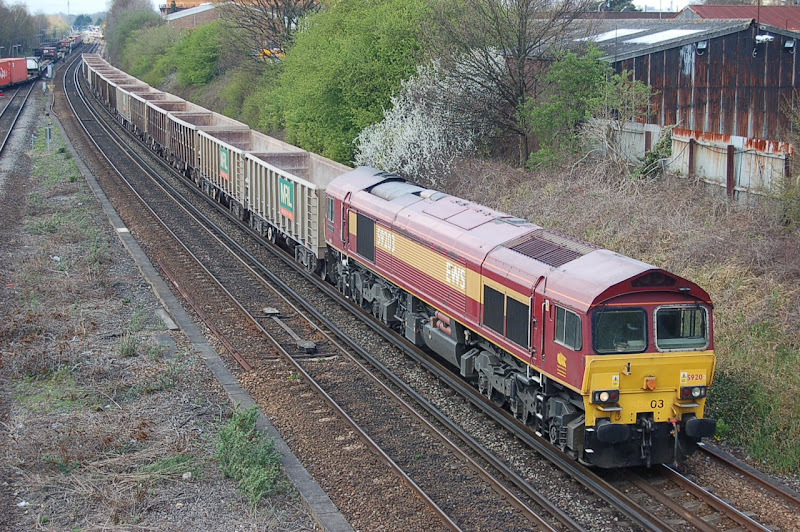 66415 6O49 10:51 Neasden - Wool approaches Redbridge, 10th April. Image by Ian Knight. 31465 with 1Q14 Derby - Weymouth - Eastleigh. Image by Ian Knight. 31465 failed before its next working. 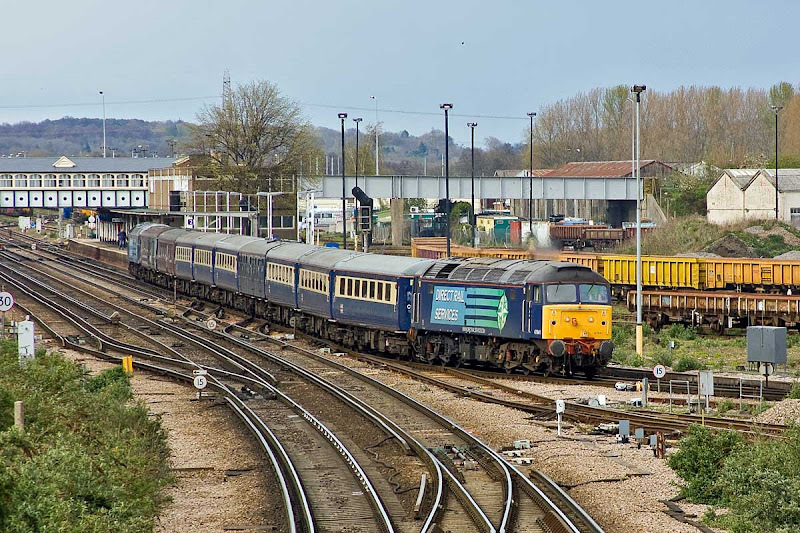 59203 Vale of Pickering passes Maritime with 7V52 12:55 Hamworthy - Whatley, 4th April. Image by Ian Knight. 67011 with 350120 from Northampton to Northam, 6th April. Image by Ian Knight. Friday 6th April: 67011 6M01 03:21 Eastleigh - Northampton, 67011 + 350120 7Z01 10:14 Northampton - Northam, 67011 6B01 16:30 Northam - Eastleigh. Recent delivery Class 70s reported out of traffic for exams.